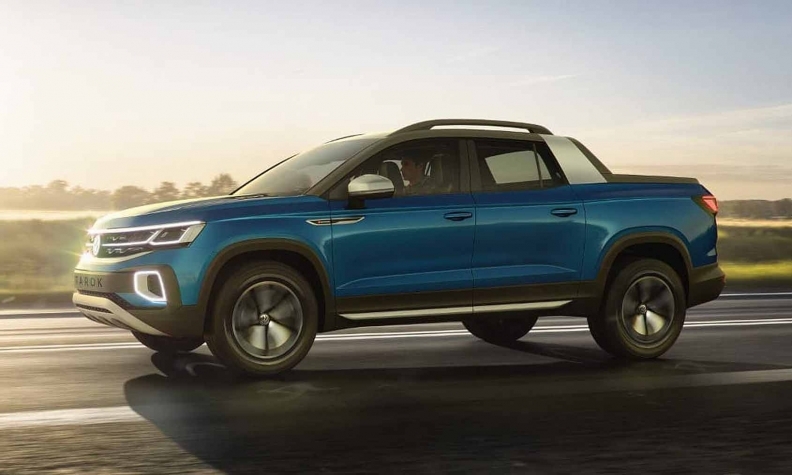 VW said the Tarok is the first pickup to combine the stylistic elements of an urban SUV with an off-road design, helped by a Targa-inspired roof bar, front end and powerful side panels. Volkswagen plans a renewed push into the lucrative compact pickup segment that has eluded the company for years. The Tarok, shown Tuesday in Sao Paulo, will soon be offered in Brazil, VW said in a statement. The truck "has the potential to boost Volkswagen's model range in other global markets," it said without providing details. The Tarok will be sold with a 2.0-liter engine that delivers 150 horsepower. VW didn't provide details on the planned price. VW has struggled to break through in the pickup category while rivals from General Motors to Toyota Motor have raked in profits. VW has made progress in SUVs, another area where it lagged behind, but its truck lineup has been restricted to the low-volume Amarok, introduced in 2010. The vehicle, which is mainly sold in South America and Europe, is smaller than Ford's best-selling F-150. VW's ambitions could get a boost from broad collaboration talks with Ford that range from commercial vehicles to autonomous driving, electric cars and potentially more. Imported pickups are subject to a 25 percent tax in the U.S., the biggest market for the vehicles, making it unrealistic to sell trucks in the market unless they are made in North America. VW CEO Herbert Diess recently told Automotive News that the collaboration talks might provide access to technology from the Ranger, a compact pickup being revived by Ford for the North American market. Working with Ford would reduce development costs for the Tarok, which at 5000mm long would be slightly shorter than the Ranger. Diess also said he sees potential for the Tanoak concept, a pickup version of VW's midsize Atlas crossover. Besides the Ranger, other smaller pickups include the Chevy Colorado and GMC Canyon, Toyota Tacoma and Nissan Frontier. VW's German rival Daimler entered the pickup segment in recent years with the premium X class.